There are few things I love more than giving gifts. I spend weeks, if not months, scouring my favorite stores and sites for the perfect thing to give someone. Sometimes, the perfect gift isn’t something you can buy – but it’s something you can make. That was the case for my gift for my friend Taylor this year. 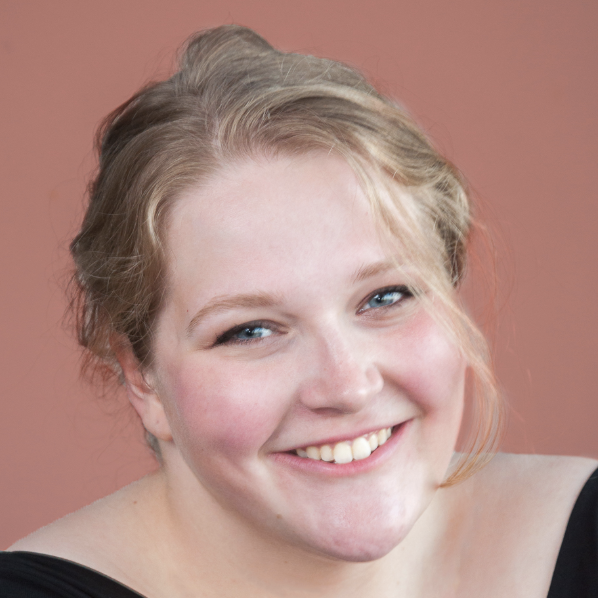 Taylor is one of my closest friends – we’re so close that she came to visit me in Oxford last spring. Taylor and I both love tea, so over the course of our friendship we’ve spent many evenings spent sitting on our beds, drinking from steaming mugs while we talk about our dreams, goals, and just-slightly-overwhelming assignments. Tea, for us, is something special – what sets apart a moment for rest, friendship, and laughter in the middle of a hectic semester. After doing a little brainstorming, I decided to decorate a tea chest for Taylor, so she could store her favorite teas in style (and not in a plastic container, which had been their previous home). To complete the gift, I wanted to stock the chest with some tea already, so it would start to get that lovely spicy, herbal smell. For this, I went to Walmart to pick up some Bigelow tea. I chose their Constant Comment, which is a lovely black tea with sweet spice and orange rind. I thought it would be perfect for cold winter evenings after Christmas. 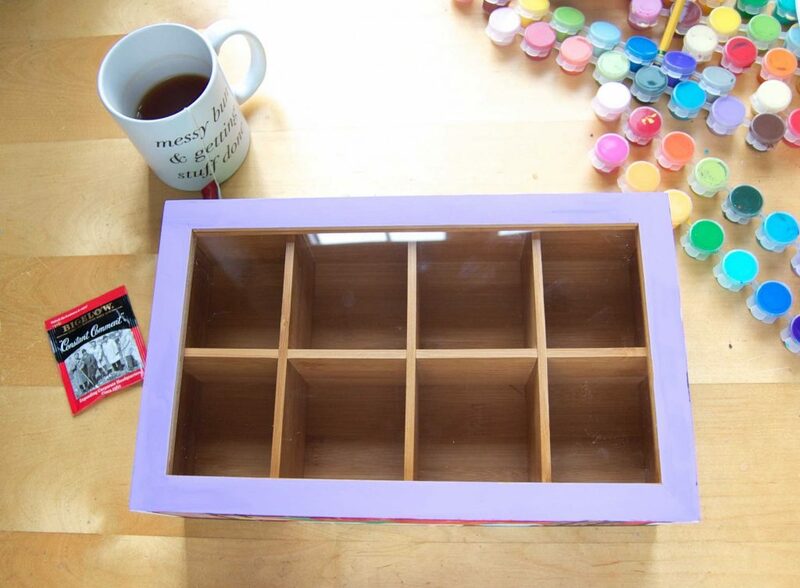 This shouldn’t be a step if you’re planning on painting your tea chest one solid color, but I decided to paint a design on each side of the box. 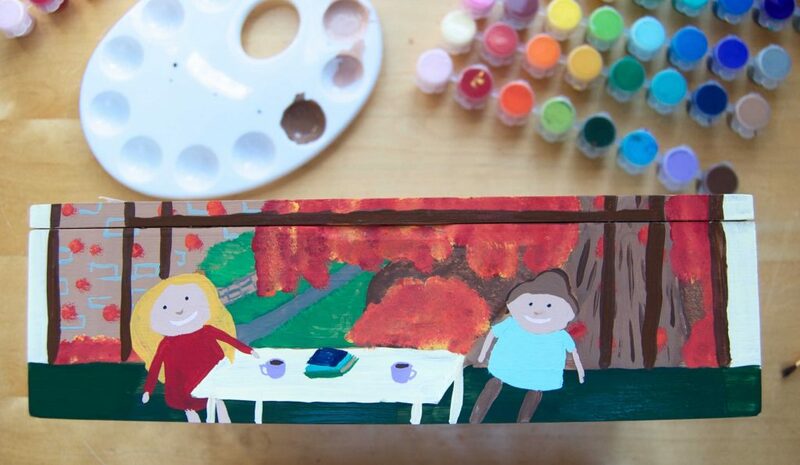 Because the box had four sides, I planned to paint Taylor and me drinking tea together in a different season on each side of the box. To do that, I sketched out a very basic outline with pencil. 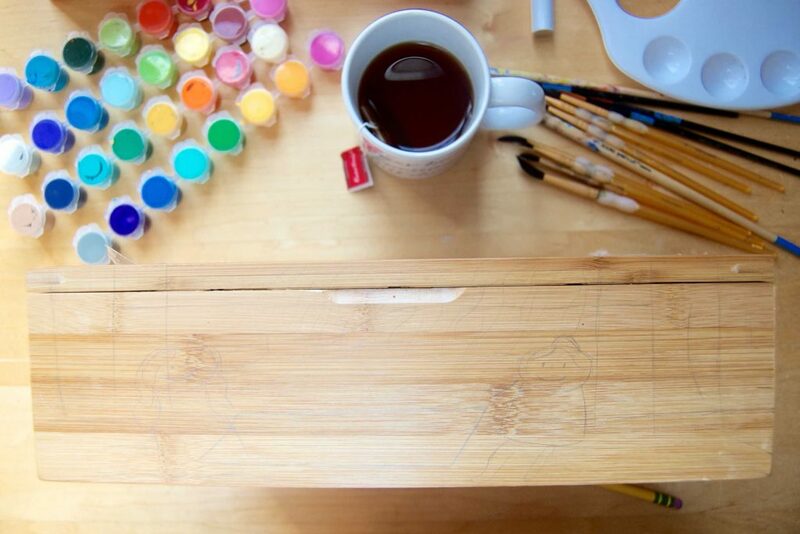 I wish I could give more detailed instructions, but the next step is pretty simple – paint! I recommend doing the four sides first, letting them dry, and then painting the top rim of the box. Here is the “fall” side of the box. I’m no artist, but I know that this box will have a special meaning to Taylor because I made it for her and it represents our friendship! 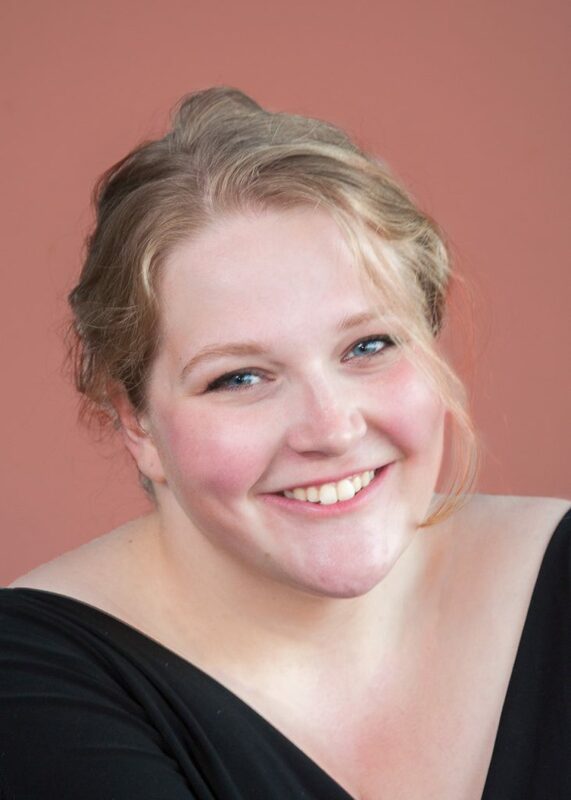 For the winter side, I had us drinking tea next to a snowy window; for spring, drinking tea as we went on a walk through campus; and for summer, drinking tea from opposite ends of the ocean (“Forever together, never apart; maybe in distance but never in heart!”). Rather than going for an eclectic collage-type feel for the top of the box, I painted it in a solid color. This would leave the focus on the letters I would paint onto the plexi-glass. 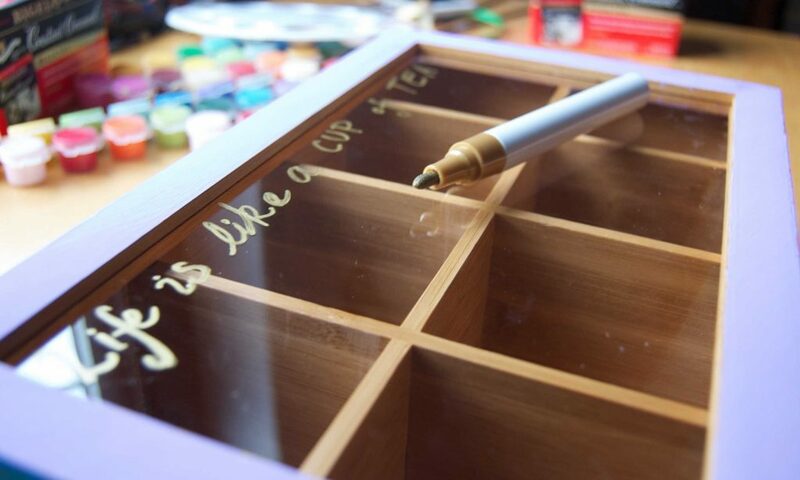 For this step, use a paint marker to letter a quote onto the top of the box. The quote I chose was, “Life is like a cup of tea; best filled to the brim and shared with friends.” The paint from the marker dries quickly, and you may need to go over the letters several times to get them looking thick enough to read easily. Next, stock your tea chest with teas. You may choose to do a bunch of different flavors, or just do one and let your friend fill the rest with her own stash. 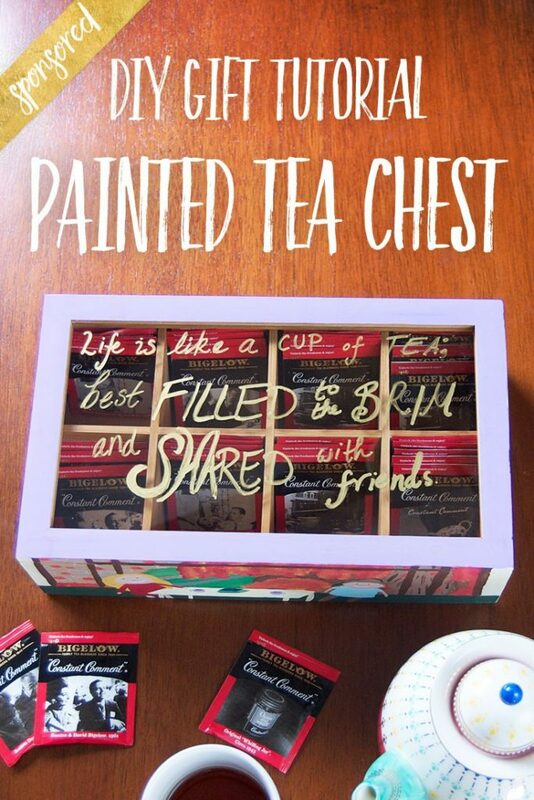 When I send this, I will probably fill one or two compartments with tea, and let Taylor fill the rest with her own. You’re all set! 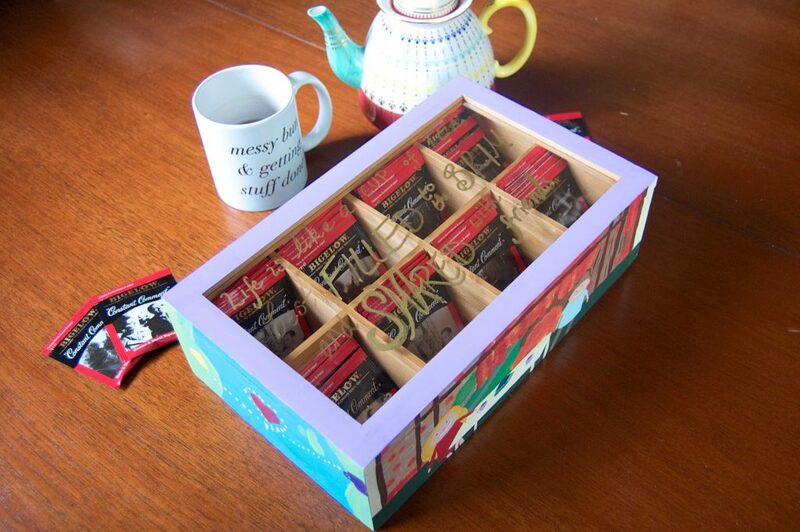 Once your tea chest is dry, it’s time to wrap up your gift and present it. I love this gift because it’s a great way to not only reflect on the past through memories painted on each side, but also a way to set aside time in the future. You aren’t just giving your friend a box – with every teabag, you’re giving them a little moment of happiness. When it comes to Taylor, I know I’m giving her moments we can share together! If you like this sort of content, make sure to check out Bigelow‘s Pinterest page, where they even have a Bigelow tea gifts board!